Whether you are a new Christian or a serious Bible Scholar that has been on the road for many years, this page is to assist you in some of the Software that are available and where you can find it. Some of it is for free and some come at a great cost. They all come highly recommended and should aid you in your understanding of the Word of God. Please do shout if there is something else you are looking for. We will gladly do the homework on your behalf, to find that which is reliable. Let's face it, you do not want to end up doing a JW Bible study programme just because it is available. The following vendors have gone to the trouble to throw the Bible as well as many other books, including commentaries into their package. Just remember that the better books are always for sale. So if the package if free, it is a nice to have, if you pay, it is better to have, and the more you pay ......... you get the point. E-sword has for many years been the favourite for many Christians when it comes to a computer based Bible programme. Well, I guess because it is free. e-Sword has sophisticated features that are simple to use! e-Sword is a fast and effective way to study the Bible! Simply click on the E-Sword graphic above to go directly to their webpage, or click 'here' to go straight to the downloads. Logos Bible Software must be the best Bible Software available on the market. They have a total of 7 packages for you to choose from. The fist one is free and does not offer much, but it is cool to start playing with, and there are a few free books and Bibles included. As you go to the larger packages they escalate in price, but are still the cheapest way to own all the books they provide. The joy is that you can search accross all your Bible and books with the click of a mouse, something you cannot do in your Paper Book Shelf. So, find biblical answers, understand what the authors meant, apply the truth to your life, and share it with the ones you love. Logos 5’s smart tools and massive networked library connect your life to God’s Word. Logos shows you where to start your Bible study. Find exactly what you’re looking for in the Bible, in your huge library, or on the Logos 5 Timeline. Logos helps you understand the Bible. Meet its characters, dig into the original languages, unearth ancient cultures, and see what it all means. Logos connects your life and community to the Word. Study Scripture on mobile apps; share it with those you lead and love; apply the Bible to your life. Besides the free Logos 5 platform, their cheapest package has R 35 000 worth of books at a cost of R 3000. Their largest package has R 780 000 worth of books for a cost of R 50 000. We recommend, you decide!! You have to spend some time on their website to understand how these packages work, so we are not going to take you straight to the downloads. If you need some guidance in the process, please do shout. This is another brilliant package which I use alongside my Logos Package on a dailt basis. 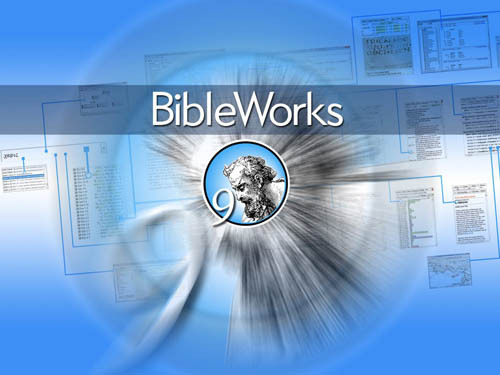 BibleWorks 9 is a large collection of software tools and database resources designed specifically to assist pastors, seminary students, professors and missionaries in their exegesis of the Biblical text. It contains more than 200 Bible translations in nearly 40 languages, 45 original language texts and morphology databases, 29 lexical-grammatical references, and a wealth of practical reference works. These include Greek and Hebrew sound files, Bible maps, Greek New Testament diagrams, Greek and Hebrew grammars, new transcriptions and image sets for seven of the most important Greek New Testament manuscripts, and the full CNTTS New Testament apparatus. These resources are presented to the user through a sophisticated but easy to use user interface that includes two powerful search engines and dozens of ways to organize, present and analyze the results of your research. To help the user master the program a comprehensive set of videos is included. A small number of critical databases are available as add on resources, but the base package contains everything that a busy pastor needs to help him use his study time wisely and efficiently. Like no other set of software tools, BibleWorks focuses on the central task of understanding the text of Scripture. It contains everything that you need and nothing that you don't need. Bible Works sell for around R 3500 and is worth every sent if you are a serious Bible Scholar. I can recommend this package without any hesitation.